The Human Rights Issue A Nobel Laureate Doesn't Want To Touch : Parallels Aung San Suu Kyi has been universally praised in her battle for democracy in Myanmar. But she has been conspicuously silent about the worsening plight of the Rohingya minority in her homeland. Myanmar opposition leader Aung San Suu Kyi speaks at rally in Yangon, Myanmar, last year. Suu Kyi won the Nobel Peace Prize for her struggle for democracy in her homeland, but has faced criticism lately for not speaking out about the plight of the Rohingya, a Muslim minority that has faced discrimination and violence. It's not often that the Dalai Lama calls out a fellow Nobel Peace Prize laureate. But that's what happened last week when he was asked about Aung San Suu Kyi, who has declined to speak out on the worsening plight of Rohingya minority in her homeland of Myanmar. The Rohingya are Muslims who have lived for generations in mostly Buddhist Myanmar, also known as Burma. They are concentrated in the western part of the country, near the border with Bangladesh. They have long faced discrimination and are not recognized as citizens in Myanmar. Their condition has attracted international attention recently as thousands have fled persecution in Myanmar. Many have been abandoned at sea in rickety boats by human traffickers and other countries in the region have been reluctant to take in the Rohingyas. The Dalai Lama told The Australian newspaper that he'd raised the Rohingya issue with Suu Kyi. "It's not sufficient to say: 'How to help these people?'" the Dalai Lama told the newspaper. "It's very sad," he added from India, where he lives in exile. "I mentioned about this problem and she told me she found some difficulties, that things were not simple but very complicated." At a meeting last week in Oslo, Norway, several Nobel Peace Prize winners delivered impassioned pleas on behalf of the Rohingya. They included retired Archbishop Desmond Tutu of South Africa, who called their condition "one of the most enduring human rights crises on earth." More than 100,000 have been living in displacement camps for years after Buddhist mobs burned them out of their homes, Tutu said. "The government of Myanmar has sought to absolve itself of responsibility for the conflict between the Rakhine [people] and the Rohingya, projecting it as communal violence," Tutu said. "But I would be more inclined to heed the warnings of eminent scholars who say this is a deliberately false narrative to camouflage the slow genocide against the Rohingya people." Migrants sit on their boat as they wait to be rescued by fishermen off East Aceh, Indonesia, on May 20. 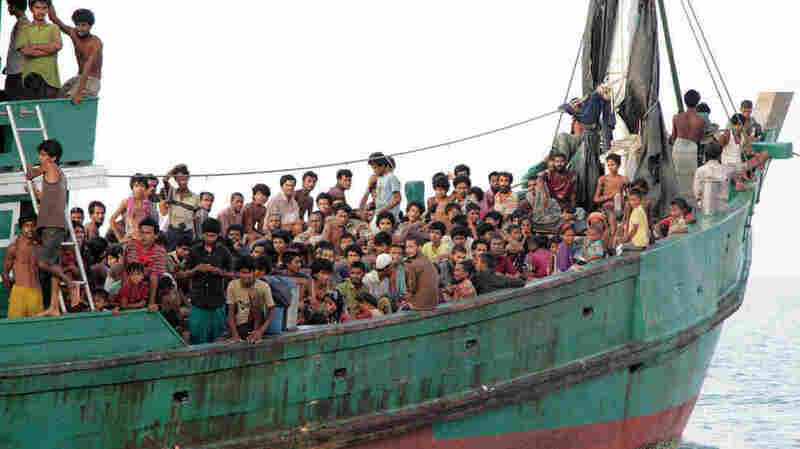 Thousands of Rohingya migrants have fled Myanmar and many have been stranded at sea as part of the growing migrant crisis in Southeast Asia. Financier and philanthropist George Soros, who fled the Nazis as a boy, visited a Rohingya displacement camp a few months ago and said the camp, Aung Mingalar, triggered memories of his childhood. "You see, in 1944, as a Jew in Budapest, I too was a Rohingya," Soros told the Oslo gathering in a video statement. "Much like the Jewish ghettos set up by Nazis in Eastern Europe during World War Two, Aung Mingalar has become the involuntary home to thousands of families who once had access to health care, education and employment." "Now they are forced to remain segregated in a state of abject deprivation. The parallels to the Nazi genocide are alarming," Soros said. Suu Kyi was not invited to the Oslo event. Her silence on the Rohingya issue over the past few years has been well documented, says Phil Robertson, deputy director for Human Rights Watch Asia. 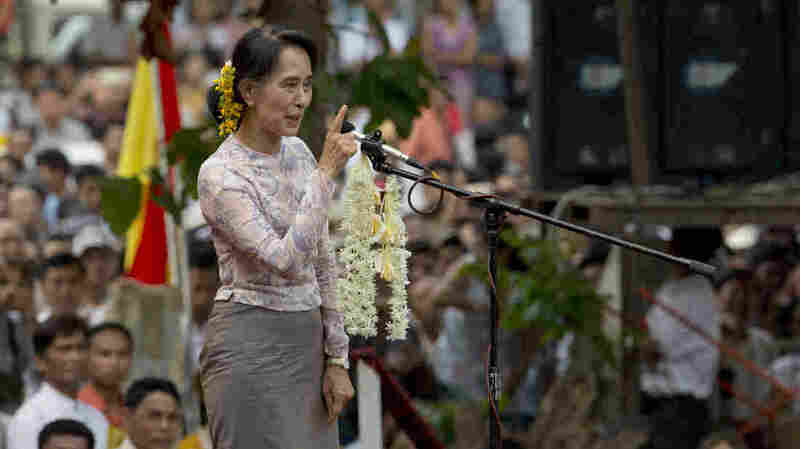 "Certainly she has a long history of accomplishment standing up for democracy in Burma. But unfortunately in the case of the Rohingya, who are stateless, now fleeing Burma in the tens of thousands, she's been remarkably silent," Robertson said. "It's been a deafening silence, one that's called into question her commitment to human rights." Robertson and other critics say it's clear that Suu Kyi is ducking the issue with an eye toward a general election, expected around the end of October, that her National League for Democracy hopes to win. Desperate Rohingya Granted Temporary Shelter. But What Next? The Muslim minority is simply not popular among the Buddhist majority in Myanmar. In the past few years, a Buddhist monk, U Wirathu, has led the anti-Muslim 969 Movement, which continues to gain strength. For Suu Kyi, speaking up for Rohingya Muslims is certain to cost her and her party. Suu Kyi, 69, is the daughter of a former general, Aung San, who was an independence hero in the country. He was assassinated in 1947, just months before the end of British colonial rule. Suu Kyi was just 2 at the time. As an adult, Burma's military rulers kept her under house arrest for nearly two decades. She's been allowed to participate in politics in recent years as the country's generals have taken off their uniforms and introduced some political reforms. The U.S. government has restored diplomatic relations and dropped many of its long-standing sanctions. President Obama visited last November. Suu Kyi, now a member of parliament, has described the U.S. as being "overly optimistic" and says the political changes in Myanmar are not yet complete or irreversible. "I think we'll accept that there is a perception that Muslim power, global Muslim power, is very great, and certainly that's a perception in many parts of the world and in our country, too." Suu Kyi also says that speaking out for one side or another might fan the flames of violence. "This is what the world needs to understand, that the fear isn't just on the side of the Muslims but on the side of the Buddhists as well," she says. "There's fear on both sides. And this is what is leading to all these troubles. And we would like the world to understand that the reaction of the Buddhists is also based on fear." In a country of 50 million, Buddhists are the overwhelming majority and Muslims account for fewer than 5 million residents. Most of those killed in communal violence in the past few years have been Muslim. "It's already tarnished her image in the international community and many people who thought she'd champion human rights and stand up for human rights principles after she was released have been sorely disappointed," says Robertson, of Human Rights Watch. "Whether this impacts her standing in Burma is another matter," he adds. "Most people believe she's a hands-on favorite to win the election."